It’s a year ago now since Sergei Stanojkovski and his team first introduced a new event to the international festival landscape with the launching of the Film Forum Zadar in the historical port on the Adriatic an hour up the coast from Split in Northern Dalmatia. The second edition of the Film Forum was held again at the end of August – from the 23rd to 30th – just ahead of the Venice Film Festival. This year, the week-long festivities were kicked off with the open-air screening of Terence Mallick’s Golden Palm-winner Tree Of Life and rounded off after the awards ceremony by Woody Allen’s Midnight In Paris on August 29. An international jury headed by veteran US indie producer Jim Stark and including Romanian actress Anamaria Marinca (seen in Hans-Christian Schmid’s political thriller Storm) and Hungarian actress Orsolya Török Illyes who made such an impact last year in Bibliotheque Pascal was set the task of judging the main competition of films which ranged from Catalin Mitulescu’s Loverboy through Maiween Le Besco’s Poliss and Lisa Aschan’s She Monkey’s to Aki Kaurismäki’s Le Havre. In addition, there were juries for the programme of documentaries and short films, and the festival’s audience was invited to vote for their favourite film to receive the Audience Award. There were film tributes dedicated to the filmmakers Amos Gitai and Bigas Luna, and collaborations with the Bologna Cinematheque and Martin Scorsese’s World Cinema Foundation resulted in the screenings in Zadar of such classics as Julien Duvivier’s 1941 Pepe le Moko, Jean Vigo’s Zero de Conduite and L’Atalante (from 1933 and 1934, respectively), and Egyptian filmmaker Shadi Abdel Salam’s 20-minute film The Eloquent Peasant (El-Fallah el-fasih) from 1970. While the first edition of the Film Forum had invited industry representatives to discuss the future of European co-production, this year’s festival provided the platform for a brainstorming about the possibility of creating a pitching forum for genre films in Zadar from 2012. Appropriately entitled Film Forum Zadar SCREAM, this section featured screenings of such films as Bigas Lunas’ Anguish or Marvin Kren’s Rammbock (see the review in KINO – German Film, No. 98) and a conference attended by international guests ranging from Jerome Paillard, director of the Cannes Market, through sales agent Sasha Wieser of EastWest Filmdistribution and UK producer Ashley Horner to Katharina Düfner of ZDF – Das kleine Fernsehspiel and Eurimages’ executive director Roberto Olla. However, it was not all work and no play: the sweltering temperatures (30-40 degrees!) were a temptation in themselves for one to want to have a refreshing dip in the Adriatic, and a day-long boat excursion took some guests around the beautiful Kornati islands off the coast from Zadar, while actor Rade Serbedzija delighted festivaliers and locals alike by appearing with his band in concert at the Arsenal late one evening. When it came to handing out the awards, Aki Kaurismäki’s Le Havre – which had for some unfathomable reason only been awarded the FIPRESCI Prize in Cannes this year – walked away with no less than five prizes: for Best Film, Best Direction, Best Actor and Best Actress, and the Audience Award. Well deserved for a film which is even more enjoyable on repeat viewings and loses nothing of its charm (I have now seen it in Wroclaw, on a magical evening on the Piazza Grande in Locarno, and a balmy evening at the open-air screening on Zadar’s Roman Forum). Meanwhile, the award for the Best European Co-Production went to Half of Oscar (La Mitad de Oscar) by Manuel Martin Cuenca who also picked up the honours for Best Screenplay, and the prize for Best Cinematography was awarded to DoP Pierre Aim for his work on Mushrooms (Chatrak) by Vimukthi Jayasundar, which had been shown in Cannes’ Directors’ Fortnight this year. 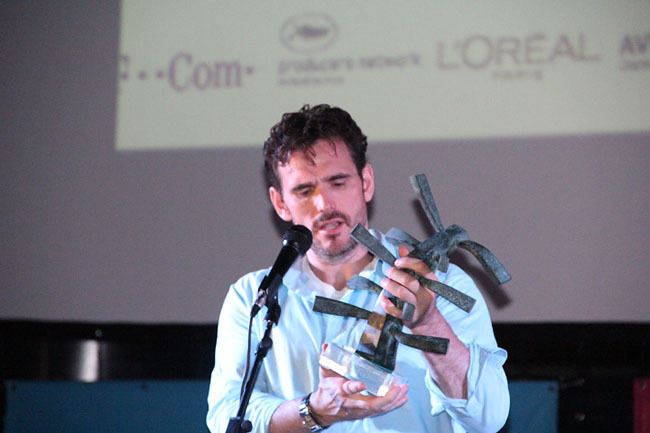 In addition, the American actor Matt Dillon travelled to Croatia for the last few days of the festival and was presented with the Tomislav Pinter Award in recognition of his outstanding contribution to film art. The award was created at the first Film Forum last year in memory of the famous Croatian cinematographer Tomislav Pinter who had worked with filmmakers as diverse as Dusan Makaveyev, Orson Welles, Veljko Bulajic, Sergei Bondarchuk, Rajko Grlic, and Srdan Karanovic. The first recipient was the German producer Karl Baumgartner.